Before the show premiered, it was right near the top of my list of most-anticipated mid-season shows. I have never watched The Shield (I know, I know), but Terriers was one of my favorite shows of the fall, and I was excited to see what Shawn Ryan had planned for his newest series. Since it was a Fox show, I wasn’t expecting an examination of urban politics, policing, crime, and corruption on the level of The Wire, but I was excited for a possible Wire-lite, from a showrunner with a proven track record on this kind of series. So, five episodes in, is The Chicago Code living up to my expectations? Yes and no. The performances, for the most part, are very strong. Jason Clarke is a great lead and is slowly adding more layers to his Jarek Wysocki. His aversion to cursing (particularly his use of “jag-hole”) awkwardly stands out, and his dialogue, especially with Teresa, is sometimes too on-the-nose, but those are more problems with the writing than with the acting. Speaking of Teresa, Jennifer Beals is also turning in a great performance as the first female Superintendent of the Chicago PD. She plays strong-willed and determined well, and it’s been nice to see her start to realize just how tricky her job will be, as she often needs Alderman Gibbons’ help at the same time she’s trying to take him down. Gibbons, played by Delroy Lindo, is the real highlight of the show. There are some structural problems, in that, as a supporting character, he can’t always be front and center, and thus his interaction with the leads is limited, but he commands the screen whenever he’s on it. Episode 4, “Cabrini-Green,” was an especially good look into Gibbons’ role in the community and gave Lindo some of his best material yet, as he made it clear why Gibbons is so beloved by his constituents and also just how far he’s willing to go to solve problems. Aside from the individual performances, the show has been well-paced so far and is really taking advantage of its Chicago setting (shooting on location is very advantageous here). It was a little ridiculous in the pilot that Teresa and Jarek seemed to expect to take down Gibbons in a day, but now that they’re realizing this is a long-term case, the show has been striking a nice balance between the cases of the week and the longer corruption arc. As Alan Sepinwall has written recently, the non-Gibbons storylines are pretty inherently less interesting/compelling than those that do directly tie back to the alderman, but I think the show is working well within that structure, and is especially strong when the case of the week is more character-driven than plot-driven. There are many strong elements to The Chicago Code, and I like the show a lot — but I don’t quite love it. There are some considerable flaws that are holding it back, and the show will need to resolve some of its more problematic elements before it jumps into the upper tier of my favorite shows. The Liam character is probably the show’s biggest weakness. By design, he can only interact with Teresa and Jarek, which severely limits his character, and forces them to have increasingly unbelievable interactions. Jarek and Liam’s most recent meeting, on top of a building over the highway in broad daylight, was perhaps the dumbest yet — for an undercover cop who keeps talking about how dangerous the job is, he needs to smarten up. Things should get interesting with Liam, now that he has an inadvertent death on his hands, but the writers still need to give us a reason to care about him, other than “by the nature of his job, he’s inherently in danger of having his cover blown.” A job description isn’t a character, and I hope they don’t take too long to develop him further. The show also telegraphs certain points a little too much. The voice-overs are one symptom of this — I’m not completely opposed to them, since it’s clear they’re part of the show’s fabric, but they can’t take the place of strong action and plotting. Also, certain lines sacrifice subtlety for clarity, but in doing so, also sacrifice their believability (“You think that’s how things get done in CHICAGO?!”). Especially early in a show’s run, the writers are more apt to take some shortcuts to ensure that new viewers are all on the same page, but I hope a certain trust in the audience starts to take hold, so the writers will be able to be more subtle and delicate in their storytelling. Overall, though, the show has a great feel and a strong cast, and really seems to be settling into a groove. Unfortunately, the ratings aren’t great, but they’re not horrible either, so at the very least, I hope we get to see a full season play out. We have a pretty good feel for Jarek, Teresa, Caleb, and Gibbons, but Vonda and Isaac have been in the background for most of the run so far, while Liam has been fairly one-note, and they need space to develop further. Also, seeds have been planted in terms of family dynamics and more personal stories, but we haven’t gotten a chance to revisit those, yet. The writing isn’t on the wall like it was for Terriers at this point, but even if Chicago Code does end up sharing the same fate as the short-lived shaggy PI series, over the next 8 episodes I hope we get to just spend more time in the world of Chicago as it exists on the show and focus more on the broader-in-scope narratives. I didn’t mention him among the other strong performances, but I’m really liking Matt Lauria as Jarek’s partner, Caleb Evers. It’s a little strange to see Luke Cafferty from FNL as a Chicago detective, since he was supposed to be 17 on that show just a month or two ago, but his charm works well alongside Jarek’s tougher approach. Chicago Code is a much more fitting title than Ride-Along would have been. 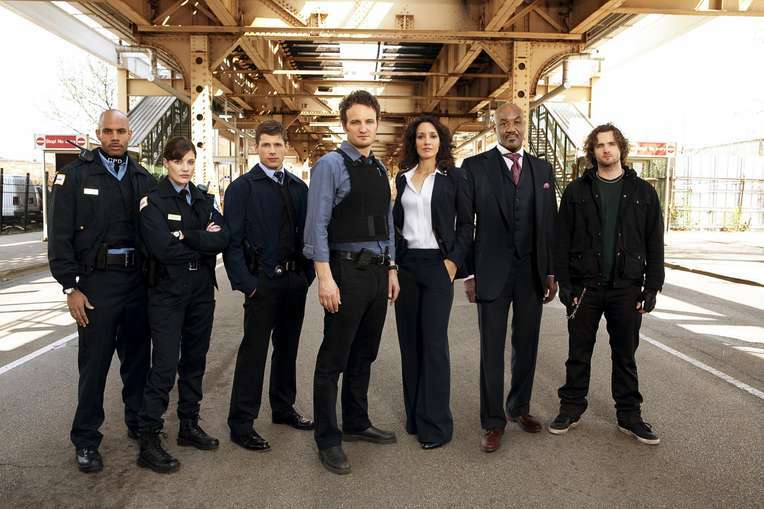 One of the best qualities of the show is that, while it focuses on the police department, it’s really about much more than just the police, and the former title wouldn’t have gotten that Chicago-centricity across. Are others watching The Chicago Code? If so, what do you think of it so far? This entry was posted in Uncategorized and tagged Chicago Code, Delroy Lindo, FOX, Jason Clarke, Jennifer Beals, Matt Lauria, Shawn Ryan, Television, The Wire, TV. Bookmark the permalink.